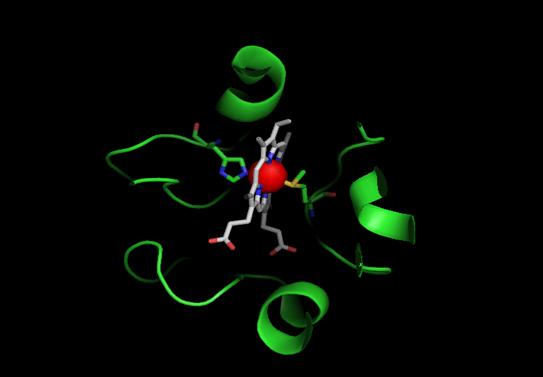 This page is an introduction to the use of the programme PyMOL for viewing protein structures. When the programme is opened go to File and open a protein structure that you have downloaded from the Protein Data Bank. These will have a *.pdb extension. Find your structure: In the search window you can type in name of enzyme or its pdb reference if you know it and an author of the paper with the structure etc. Clk on title of the protein. This goes to a much more extensive description (valuable). Rt Clk on Download Files and choose the option of saving as pdb file. The programme includes the Viewer plus a control panel. Both come up together. To increase size of the viewer, drag from its corner. 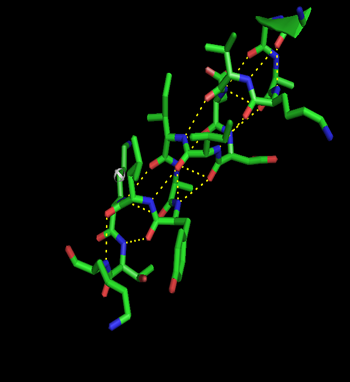 OPEN new structure (*.pdb) in File (top left). H is Hide – hide waters, dots, sticks, side chains etc. L is Label – label residues, elements, chains etc. C is Colour – by elements, chains, etc. Huge range so explore. Put sequence of protein across top (Clk Display/ Sequence or Clk S in RBmenu). This can then be used to select parts of sequence or individual amino acids. The amino acid sequence is followed by haem pqq etc and then waters which are shown as red crosses and can be removed. NB Can have 2 sequences present; then can select a helix sequence and display as Cartoon and on the select individual amino acids and show. NB if the protein is a dimer then 2 complete sequences are shown one after the other. Can remove one whole set to work on a single dimer. Select /molecule (BR) then in TR menu Action/remove. Rotate: Lt Clk on structure and move mouse (imagine structure as a ball). Rotate in plane of screen: L clk outside structure and move cursor. Move structure; Clk wheel and move cursor. Note. Selected atoms etc are marked on screen with dots. These disappear when an area outside the structure is clicked. The structure is always presented as Lines. Even if these are replaced with ribbons etc it is a good idea to leave them until your structure is well developed. They can then be hidden (and brought back later if necessary). 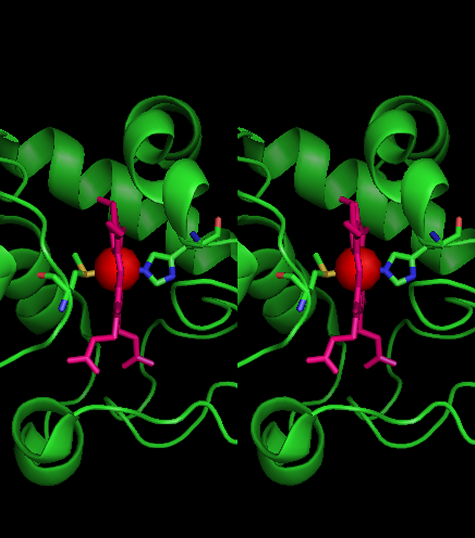 The cytochrome displays 3 copies (it had crystallised as a trimer). TR menu (sele) Action / remove atoms. Remove waters: TR menu Action/remove waters. If you think you might want them later then Hide/waters. Show sequence: BR / S. Note that the haem molecule is represented by HEC at the end of the sequence. 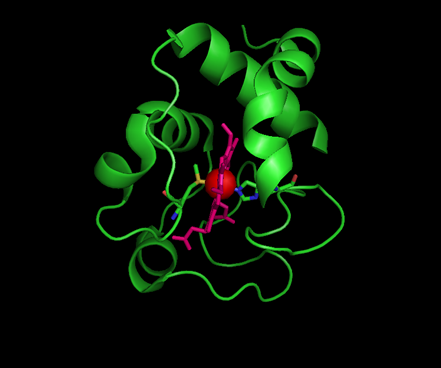 Colour haem red so it is easy to find: On the sequence bar at the top move along it to HEC. Clk it. Then TR (sele)/ Colour/red. Centre the molecule on the iron atom at centre of haem: BR/Select/atom then ckl on centre of haem. TR/sele/Action/center. You may have to zoom in to accurately choose the iron. Show main structure as helices etc. BR/select molecules; Clk on any bit of main structure; TR/sele/Show/cartoon. Show iron as red sphere: BR/Select/atom. Clk on position of iron; TR/sele/Show/sphere; Colour/red. It is a good idea to explore your structure. First save it so you can go back if you get confused. Especially see the effect of showing as spheres, sticks, etc (using TR menu/Show. Isolation of a single helix to play with. Start with the cytochrome structure. Save with name helix. BR/sele/residues; On sequence bar clk all residues from 1-84, leaving the C terminal helix unselected. TR/sele/Action/remove everything – removes all that you selected. To hide the haem: Select HEC; then TR/sele/Hide/everything. Centre on the residue in middle of helix: BR/select Residues; Clk on centre of helix; TR/ sele/Action/centre. Eg Show/sticks. This shows sticks AND helix. Hide helix by keeping the selection and TR/.Hide cartoon. Using Slab to isolate parts of interest.